Another night, another tweet up! This time it took us out of town…all the way across the Lions Gate Bridge to West Vancouver! Beachside Forno (@beachside_forno) is in the heart of the Ambleside neighbourhood, easily located on Marine Drive so my friend, Brian (@br_webb) and I decided to take Transit. This was our first visit but the restaurant is instantly warm & inviting and although it was dark we could tell that there would be a great view from the back patio, overlooking the water and Stanley Park beyond. The Beachside crew has tasting bites of their great pizzas for the guests to sample…with ‘Forno’ in your name your pizzas better be good and these lived up to the name. Crispy, simple and very tasty! Skyy Vodka & Granville Island Brewery kindly donated some of their product so the minimal charge for drinks was donated to support Movember for Prostate Cancer awareness. I’d also ordered a ‘Beachside chicken burger’ which was very nicely topped with pesto, portobello mushrooms and provolone, accompanied by a very nice salad of mixed greens. All the food from the menu looked excellent. Organizer Jennifer Kemshaw (@jkemshaw) did a great job of getting the word out to a variety of Tweeps and Facebookers to come down, get a taste of the Beachside Forno experience and meet each other. Besides meeting Jennifer for the first time, I got to meet @604homesguy @AliciaHollywood @rezg23 @HeadtotheNet @brandanprice and reconnect with @jessebowness @Lev_ivy again. We all look forward to catching up again at the next tweetup. Perhaps another at Beachside Forno? Tonight Hot Deals Live and r.tl Regional Tasting Lounge hosted a very successful tweet-up. What was expected to be about 15 people turned into nearly twice that many. For many of us it was our first experience at r.tl and they did an excellent job of introducing us to a sampling of their menu. Warm marinated Olives, Roasted Beet Salad with goat cheese & arugula, Quinoa Salad, Prosciutto wrapped Dates were followed by grilled chicken skewers with jerk sauce and an earthy, rich Mushroom & Truffle Risotto finally mini Venison Burgers. Everything was hearty, healthy and tasty. A nice cocktail menu and wine list paired completed the solid menues. Finally, on the last home game of the season, I made it to Empire Field! While BC Place is under renovations the CFL’s BC Lions have ventured across town to their old East Van stomping grounds and encamped at a temporary 27,000 stadium at Empire Field. I’d heard all season about the great views and audience experience and I must agree they have done an exceptional job for a temporary venue. We had great seats (thanks Pam!) in the second row, right behind the Lions bench but it looked like every row had great sightlines of the field. There was decent, fast service at the concession stands and beer stalls around the outside of the stadium. Since it was a dry, warm afternoon when the game started it made the experience even better. Next season Empire Field will be temporary home to another football club as Whitecaps FC begin their premier MLS season at the field they also played on back in the NASL era. 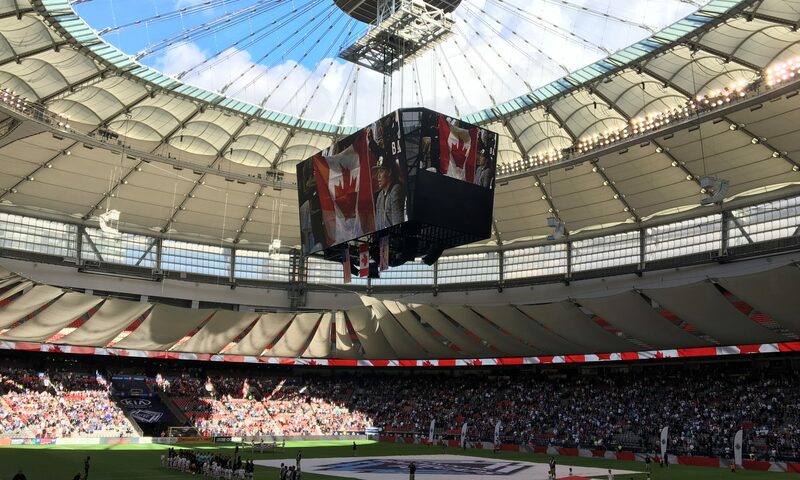 Once BC Place is completed, scheduled for June, the Whitecaps and Lions will play under its new retracable roof and Empire Field’s temporary structures will come down and it will revert back to a public field. I look forward to seeing more games at Empire! Last night I had the privilege of watching the Vancouver Canucks overtime win against the Colorado Avalanche from the comfort of a Penthouse Executive Suite at Rogers Arena. The game also featured a pre-game induction of the Canucks first Captain Orland Kurtenbach into the new Ring Of Honour. The great folks at Metropolis at Metrotown hosted a Social Media night to introduce us to Metropolis Hot Seats. It turned out to be a great tweet-up as many of us followed each other on twitter but hadn’t yet met in real life. As you can see from the images above the view is amazing from the 5th level suite, if (for some reason) you tire of the view or peckish head inside to the lounge area, grab some food and a beverage then sit back in the comfy leather chairs and watch the game feed on the large screen tv! The Suite has all the comforts of home, if home had a live NHL game happening in the rink downstairs! You can win the chance to experience these Hot Seats to a Canucks game or concert for yourself, just look for an entry box at a Metropolis at Metrotown Customer Service Desk. Metropolis is putting lucky winners in the Hot Seats for every event at Rogers Arena throughout the year! Follow @metropolitmet on Twitter, ‘Like’ Metropolis At Metrotown on Facebook and visit their website for up to date information on the next contest.